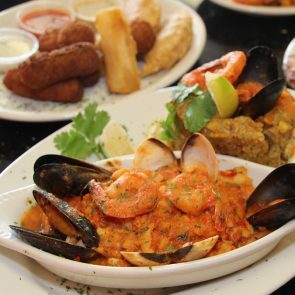 The Best Authentic Dominican and Cuban Food in Orlando. Join Us for our Endless Happy Hour. I have eaten at this restaurant many time but I tried the sword fish and is really good. Instead of getting 2 differents sides I got extra tostones. The service is excellent you are treated like family. The cortaditos (expresso coffee with a small amount of milk) is the best in town. My wife and I were perplexed to find a place for lunch, which was quick; but, had good food, when we realized that Rice and Beans Cocina was right up the street. So, we hopped in the car for a short drive; and, arrived shortly before the lunch rush. We proceeded to the counter, where they feature the daily items; and, chose a pork stew for me; and, stewed chicken (dark) for my wife. Each meal comes with maduras (sweet, fried plantains) as well as rice and beans. My wife opted for the black beans and white rice, while I chose the red beans and yellow rice. Bucking convention, we asked for the beans to be served on top of the rice, which was done. I also ordered an "aqua fresca" with tamarind flavoring, while my wife tried a bottled cream soda. Everything was super tasty, more than ample servings, and was served quickly, by a freindly and informative staff. We noticed a number of folks who were confused by the set up; and, needed help with the items. Everyone seemed ot enjoy their meals as much as we did. I stopped in to pick up lunch for my wife and I; and, I ordered the Pulled Pork with red beans and yellow rice, which was the special of the day. To be safe, I ordered the baked chicken for my wife, with black beans and white rice. As on a prior visit, I ordered the tamarind drink; and, got my wife a creme soda. Both meals came with sweet plantains (maduras.) Everything was packed nicely to-go; and, the manager and I talked about south Florida (where he grew up, just blocks from our old residence!) It was a nice visit; but, what looked like a "cash mob" showed up as I was leaving, with no less than 50 people waiting to be served! My sister, best friend & I visited for lunch (a clerk at the store highly recommended it) we were greeted by Kayla our server. She was kind, courteous, friendly & very helpful with recommending items to try. We ordered the mofongo with pork for starters DELICIOUS! We all tasted each others meals. Vinaigrette steak, beef stew w/potatoes, lechon asado (roast pork) w/rice & beans, plantains, fried yuca (fried cassava). EVERYTHING was DELICIOUSLY SCRUMPTIOUS! The coffee brought me right back to my vacation days in the Spanish isles! We'll definitely be back to enjoy the GREAT food & service at Rice & Beans! Lunch with the girls...GREAT CUSTOMER SERVICE! "I snuck over to Cuba once and the food was fantastic. I continue to go to Rice & Benas because it brings back all those memories. Thank you for always haveing amazing food and taking me back in time." If you are looking for, not just good but great Cuban/Dominican/Puerto Rican food in central Florida then this is the place for you. This has become our hangout every Friday, even though is about a half hour from us, but the drive is so worth it. We haven't had a bad meal here yet. From the Churrascos, to the mofongos, to the Ropa vieja, to the mariquitas, everything is delicious. The service is equally great, and the owners are super friendly and welcoming. The best part is the price, we have been here with 6 people and ordered appetizers and entrees and spent less than $100.00. Their dinning room and bar area are brand new and very elegant. They have live piano on the weekend so its a great place to just kick back and relax with your spouse and a good bottle of wine, or just a great place for families and large groups. The only thing they need is a Happy Hour with just a couple of affordable wines or beers!! Besides that, I assure you, you will not find better food anywhere but in your mom's kitchen. The Best Cuban Food in Orlando!!! A big step above the usual Cuban food. Generous portions, reasonably priced, friendly staff and quick service. There are two sides to the restaurant; one a cafeteria style: order at the counter, and the other side a nicely decorated sit down dining area. My husband and I will return again when in the area. This was our first visit and we were not disappointed! There are two parts of the restaurant - a quick service and a sit down / dining room. We chose the sit down / dining room area. We had an awesome server, Dolores, who really is an asset to the restaurant! We started with Sampler Platter - you MUST try this! I could have just had that for lunch and been happy. It is THAT good! Empanadas (two kinds!) plus croquettes, yucca frita, and papas rellena...and three different house-made sauces for dipping. We also got delicious hot bread and butter and fresh, crisp salads with house dressing with our meals of Churrasco (cooked perfectly to medium rare) and Lechon Asado. Sides were yellow rice, black beans and rice, plantanos, and yucca between the two of us. Dessert was the outstanding house-made tres leches cake. The cold and refreshing mango drink is excellent too, and they pour a good Tequila shot! Can't wait to return! Highly recommend! I went there with my Brother in law on a Friday nite. the food was great. I ordered a skirt steak with tostones and rice. Sangria's were also very good and reasonably priced. we really enjoyed this place and the live latin jazz just completed the experience. Nice selection on the menu. Service is top notch, pleasant and fast. Restaurant is clean and well maintained. We had flank steak and pork mean. Very tasty and a very large portions, more than enough food left over for another meal. The Red Sangria was as good as we had in Panama. This excellent restaurant was recommended to us by the staff in our hotel, and we had a great experience. The food was delicious (fried yuca with garlic sauce, lechon asada, sweet plantains, rice & beans), the freshly made cocktails were tasty, and the waitress was very professional & personable. It was a busy Saturday night with quite a few people eating dinner, but it wasn't too loud so we could talk. The restaurant is nicely designed and is located in a busy strip mall. This is one of my favorite lunch spots, serving comfort food that reminds me of eating at home. Lunch is quick, even with Waterford traffic, I can leave work, eat lunch, and come back in less than 1 hr. The food is good. My favorites include the beef stew, pernil, pastellon, trifongo, and the guava and cheese empanadas! The staff is friendly and attentive. I always leave this place wanting to take a nap after eating so much delicious food! My family and I thoroughly enjoyed this restaurant. The martinis and mojitos at the bar area were fabulous but the sangria was a little sweet for my taste. All the food was great but my favorite was the roasted pork. It was amazingly tender and flavorful. The mojito garlic dressing is fantastic - it comes with the yuca but it tasted good on everything. Portions are generous. My second time here. Really enjoyed Pechuga Rellena with yuca frida and plátanos Maduros. It's like a Cuban version of chicken cordon Bleu. My guests had mofongo and, each, bistic encebollado and Pechuga a la vinagreta. Very nice decor and pleasant staff. Looking forward to dining here again on next trip to Orlando. Dine in or take out. Food is consistently good and the price is reasonable. This is my 'go to' place when I am craving Spanish food. "The empanadas are amazing! They taste exactly like the empanadas I had in Dominican Republic. Everything I've had here was delicious from the sandwiches to the ropa vieja." I love Rice and Beans! The food is fantastic and the service has always been good. Now they have the full-service restaurant next door and its twice as big. The Pernil is fantastic - so flavorful. We love the Pastelón. My family actually requests it. For a light meal try the Media Noche. The portions are generous and the prices are very reasonable. We eat there at least once a month, but could probably go weekly!